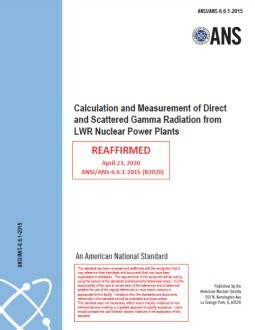 This standard sets forth values for the decay heat power from fission products and 239U and 239Np following shutdown of light water reactors (LWRs) containing 235U, 238U, and plutonium. 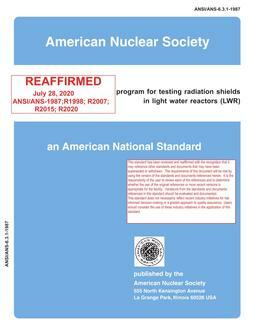 The decay heat power from fission products is presented in tables and equivalent analytical representations. Methods are described which account for the reactor operating history, for the effect of neutron capture in fission products, and for assessing the uncertainty in the resultant decay heat power. 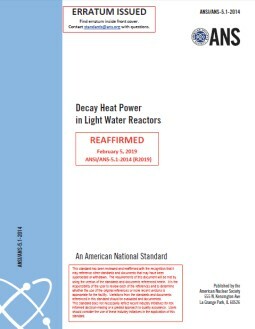 Decay heat power from other actinides and activation products in structural materials, and fission power from delayed neutron-induced fission, are not included in this standard and shall be evaluated by the user and appropriately included in any analysis of shutdown power.